Regain movement in your hands, arms, core, and legs with this DVD set to get stronger after stroke. FlintFit contains 4 DVDs categorized into exercises for hands, arms, core, and legs. Each DVD contains four 5-10 minutes fitness videos led by licensed physical and occupational therapists. 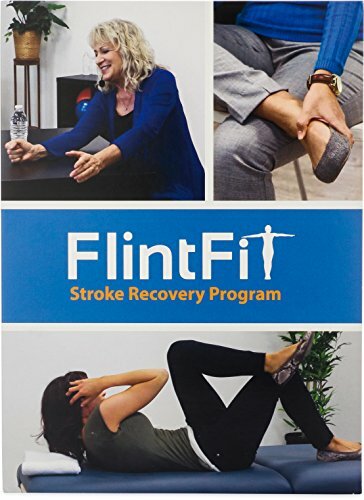 FlintFit is the first stroke recovery program that allows patients to exercise with a licensed therapist with ever leaving their home. The FlintFit stroke rehabilitation video program offers fun and easy-to-follow exercise videos that target the wrist, arms, core and legs. The Warm-Ups and Level 1 videos are perfect for survivors who are trying to recover from paralysis or severe weakness. The Level 2&3 videos are great for creating consistent challenge. A great compliment to brain exercises or books like my stroke of insight. Flint Rehabilitation Devices, LLC is a US manufacturer and retailer of premium quality rehabilitation and exercise equipment. For stroke, brain injury, or neuologic injury. Improve movement in your hands, arms, core, and legs and get stronger after stroke with this DVD set. Safe and easy to follow at home stroke recovery exercise program. Contains 4 DVDs categorized into exercises for hands, arms, core, and legs. Includes 4 stroke exercise DVDs each with four 5-10 minutes fitness videos. Follow along with the stroke exercises that the physical and occupational therapists perform in each video. Videos progress in difficulty. Warm-up exercise videos are intended for individual with severe weakness. Level 2&3 exercise videos are intended for individuals with mild to moderate weakness. If you have any questions about this product by FlintFit, contact us by completing and submitting the form below. If you are looking for a specif part number, please include it with your message.